Smart Remote Control BMW Car Key Fob 433 Mhz Smart not included programming remote with Electric Transponder Chips Fit BMW X5,X6 Series. Button Type: 4 Buttons ( Lock / Unlock / Trunk/ Panic). Other Part Number: X5,X6 Series. 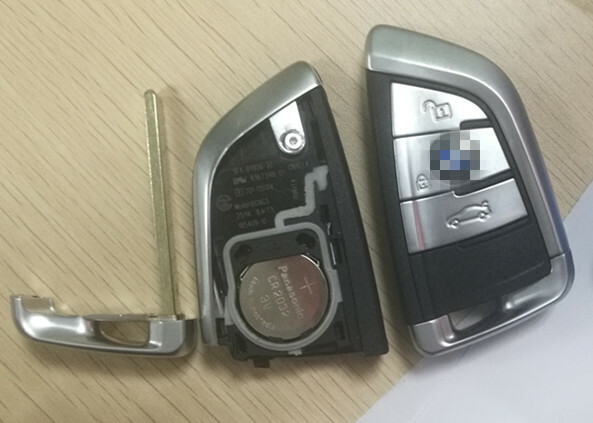 We supply all kinds Smart Key Blade,all series Remote Key Shell,Remote Key Control,Circuit Board,Transponder Chips.They are of the best quality. This remote will have to be reprogrammed .This key fob need to be programmed at your local dealer or car locksmith.Blade also need to be cut. This BMW REMOTE will only operate on vehicles already equipped with a factory keyless entry system. All controls include a battery, are tested before shipped . Please check the part number and other details with your key. All our product have been checked and packaged in good condition before shipment. We will respond to all email enquiries within 24 hours. Items will be shipped within 1-2 business days (not include weekend and holiday) after the payment cleared. It needs to be cut and programmed at your local dealer or qualified locksmith.